Often I’m asked by the readers to share more comfort food recipes on the blog. Before we step into that section let me ask you all a simple thing, ‘What do you understand by comfort food?’ To me, comfort food is my soul food for which I need no preparation no recipe and of course no planning from previous night. It is something which I can make just right after stepping into the kitchen. 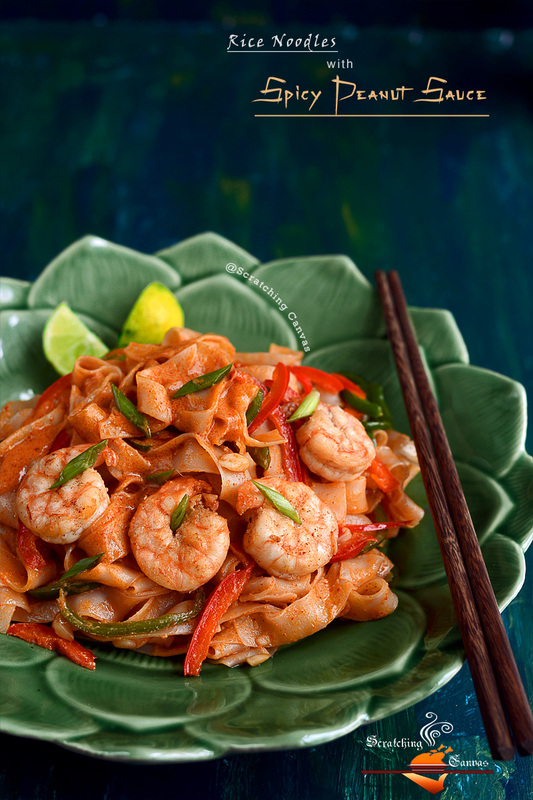 Just like my newest favorite Peanut Sauce Prawn Noodles or you can call it as Asian Rice Noodles with Peanut Butter Sauce. You might be thinking, ‘Peanut Butter in Noodles? Eewww!’ if this is the thing in your mind then you are completely wrong dude. It’s a delicious and totally slurp worthy noodles in super creamy sauce with delecious peanut butter (PB). It’s a perfect example why you should take out the PB jar from breakfast table immediately. Spreading it only on bread slices is an insult for such a delicious ingredient; rather dig your fingers in it and lick it off!!! And if you got some left overs then try to use in different recipes like ClassicPeanut Butter cookies (umm I need to bake some now! 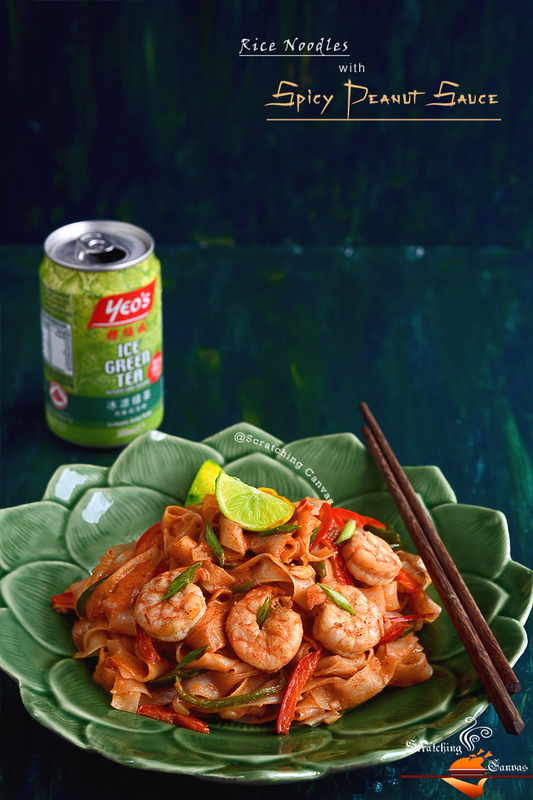 ), West African Peanut Butter Chicken, ‘0’ Oil Baked Peanut Sauce Chicken or this Peanut Sauce Rice Noodles. As I cooked this dish on a weeknight I dint have any time for preparation so I simply used store bought PB but I promise once I’ll settle down with the primary rush I’ll share the easiest Homemade Peanut Butter recipe. This recipe has taken the softest corner in my heart already because of the simplicity; even your 4 years old can do it within 10 mins (without the prawns of course)! All you need to do is throw everything in a large pan keep it on flame and that’s it. Eat it from the pan if don’t bother to wait to serve on a fancy plate only to wash it later! Sighs! Note down the recipe of Peanut Sauce Noodles aka Asian Rice Noodles to make yourself happy and hassle free on weeknights! Next, prepare the Rice Vermicelli Noodles quickly. Meanwhile, start preparing the sauce. Take a small saucepan or large glass bowl and mix all the ingredients under ‘the sauce’ and keep it in simmer until peanut butter & honey/brown sugar dissolves completely. Remove the saucepan from flame but keep the sauce warm. Finally, let’s do the assembling. Add the de-tangled rice noodles and stir quickly. Pour the sauce and mix thoroughly together. Sprinkle the spring onion and serve with lemon wedges on side. 1. Use spicy chili oil or any other regular oil instead of sesame oil. 2. Use Paneer or Tofu instead of prawns for vegetarian versions. 3. Use scramble egg on the top or add boiled eggs or any other meat. 4. Add 1-2 tbsp of tomato ketchup in the sauce to create variation in taste. 1. Don’t attempt to sprinkle salt otherwise prawns/shrimps will release hell lot of water and which will squeeze out the fresh flavor from them. And peanut butter has more than enough salt in it so actually you won’t need to add any salt at all. 2. If you are not planning to use the noodle immediately, cover the drained noodles with cling film and keep separated, until needed. 3. If you are not comfortable in cooking all these together, cook the veggies separately but remember thus total cooking time will be longer than mentioned here. 4. The prawn/shrimp will continue to cook in the heat itself inside the covered pan but there will be no chance of over cooking. Otherwise cook the prawn/shrimp according to your personal preference. 5. Always squeeze the lemon/lime at the very end moment of cooking or just right before serving otherwise the dish can get slightly bitter flavor from over cooking with lemon/lime. I love peanut sauce but have to say I have never made it from scratch before. This dish looks incredibly delicious and I have to make it!